This is a traditional Malay food and the name nasi lemak translates to fatty rice. The ‘fatty’ actually means ‘rich’ or ‘creamy’ (thanks, Wikipedia!) but then again this dish really is a fatty food. The rice is cooked in coconut milk with pandan leaves (or screwpine leaves) added for the fragrance. When I was much, much, much younger 😛 it was served with just a small piece of fried egg, a slice of cucumber, roasted peanuts, a small fried fish or anchovies and spicy hot sambal chilli (yep, spicy hot again!). Now there is a wider variety of accompaniments like fried chicken wings, luncheon meat (or spam), beef rendang, hard boiled egg, the works…whatever you fancy. 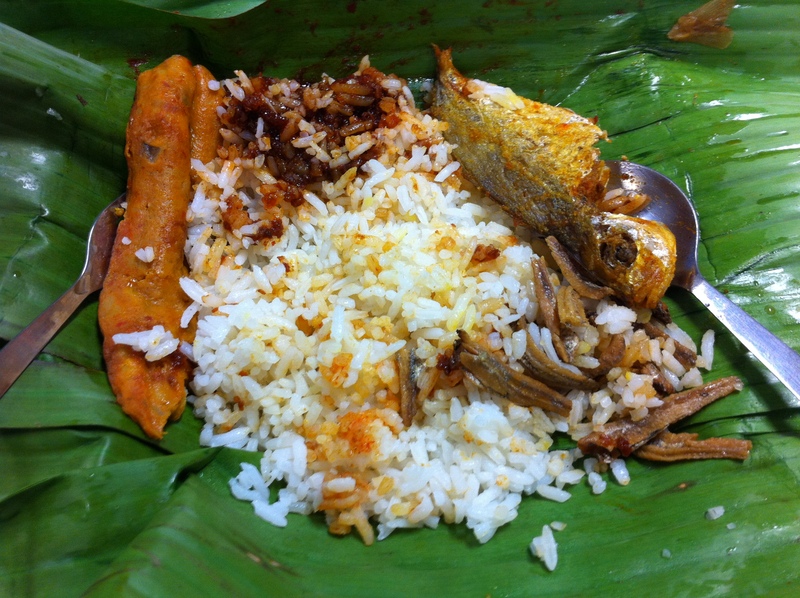 The nasi lemak is traditionally wrapped in banana leaves and eaten as breakfast but times have changed and they are now sold in foam boxes or waxed paper, although the banana leaves type still remain. And it is eaten as breakfast, lunch, dinner or even tea break and is no longer a dish limited to the Malay stalls. Chinese now have their own variation of the dish although I would pick the authentic Malay ones anytime. The fragrant rice and the sambal chilli are the differentiating factors in determining if one nasi lemak is better than the other. Having introduced the dish, I must tell you my childhood memory involving it. My dad would sometimes go to a Malay neighbour’s house to buy packets of nasi lemak for us on his way to work. Then he would shout to us from downstairs (we lived 4 floors up) and we would lower a basket tied to a long raffia string. He would then put the breakfast into the basket for us to hoist it up. Breakfast is served! Now I really must run home and get this for dinner. Nasi lemak, here I come! But my memories of those breakfasts are wonderful..Just as yours are of your father getting you nasi lemak and hauling it up in a basket….loved that part..